46% of respondents identified the leader of their organization as a woman; 27% of whom are women of color. 45% of respondents strongly agreed or agreed that women are equally represented as leaders of CDFIs. Of the 29% who disagreed or strongly disagreed that women are equally represented as leaders of CDFIs, 100% indicated women are underrepresented as leaders of CDFIs. 90% of respondents indicated they see themselves as leaders. 25% of respondents with female leaders work at organizations where the primary line of business is commercial finance compared with 36% of the entire survey pool. The following chart shows the percent female leadership at CDFIs by asset size. 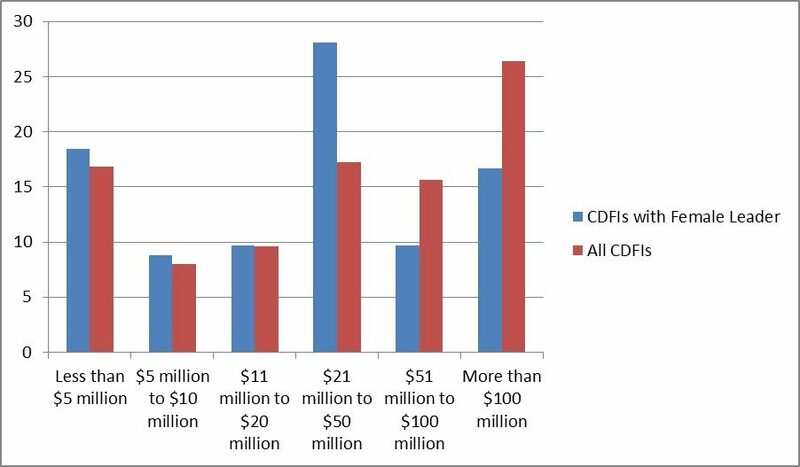 It is clear that while women are equally or over-represented as leaders of CDFIs with assets under $50 million, they are less likely to be leaders of CDFIs with assets over $50 million. In the largest size, 17% of respondents with female leaders work at organizations with assets over $100 million compared 26% of the entire survey pool. The survey findings further indicate that organizations with female leaders tend to be more inclusive, have friendlier policies for women, and are more likely to have female role models. 90% of respondents with female leaders strongly agreed or agreed that all genders are valued equally in their organization compared with 77% of the entire survey pool. 80% of respondents with female leaders strongly agreed or agreed that their organization has policies to encourage inclusivity and diversity compared with 73% of the entire survey pool. 17% of respondents with female leaders strongly agreed or agreed they have felt limited in opportunities in the CDFI industry because of their gender compared with 24% of the entire survey pool. 83% of respondents with female leaders strongly agreed or agreed they have female role models at their organization compared with 66% of the entire survey pool. 73% of respondents with female leaders strongly agreed or agreed their organization has policies that are female / mom / family friendly compared with 65% of the entire survey pool. Next month we will turn our focus to the resources available for women in the CDFI industry. In the meantime, we would love to hear from you! What can you tell us about female leadership at your CDFI?